Boulevard Mercantile has become a go-to destination for vintage-loving home decorators. It's nigh impossible to make a "quick" stop at local vintage shopping destination Boulevard Mercantile. Experienced shoppers know to plan to spend at least 30 minutes there, slowly taking in all the delightful items on display, from racks of vintage fashion to amazing pieces of heirloom and mid-century furniture, retro business signage and home decor items galore. In the past four years since opening inside the historic corner building at Northwest Boulevard and Monroe, Boulevard Mercantile has become known as a go-to treasure trove for vintage-loving home decorators and collectors. 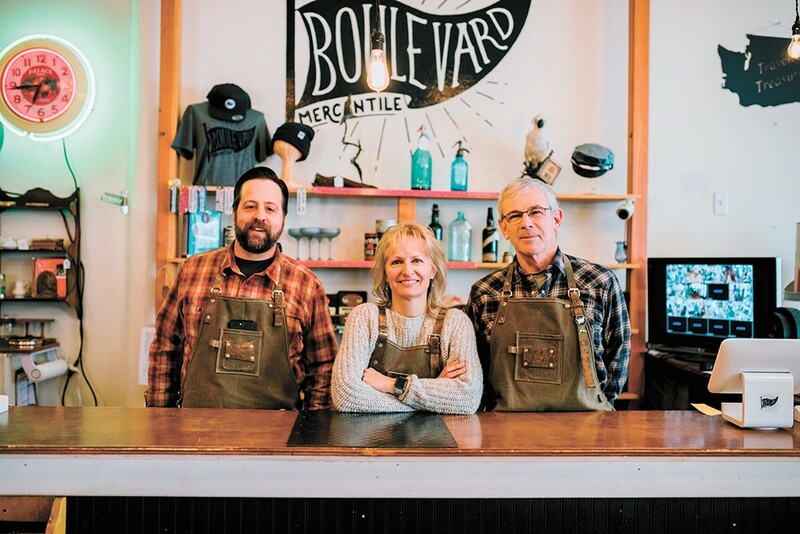 These aren't only local shoppers — the store's owners have even shipped pieces across the country to buyers who find them on Instagram, @boulevardmercantile. "The store has been amazingly successful, beyond our imaginations," reflects David Jeffers, who owns Boulevard with his wife, Joellen Jeffers, and partner Dan Webb. "The story I would tell is that when we opened, we have a warehouse to supply the store and we thought we'd be good for a year," Jeffers continues. "Within two months we knew we were in trouble." Boulevard's inventory is also supplied by partner vendors, 12 in total, who rent spaces inside the store to display and sell their own curated wares. "It does take all of us to make this successful, and we try to have a good selection of inventory that meets the needs of a very wide customer base, from vintage clothes to high-end antiques and advertising," Webb says. "We have people coming in multiple times a week just to see what is new," Jeffers adds. Beyond the many loyal customers decorating their homes with one-of-a-kind finds from its sellers, Boulevard's owners also credit the local interior design community for elevating its profile. "It's exciting to see high quality vintage pieces elevating Inland Northwest homes," says Joellen Jeffers. "We also love seeing on social media how customers incorporate their vintage finds into their homes." Though Boulevard's story may make it sound easy, finding success in the growing vintage resale market isn't, especially as competition for quality items from decades past increases locally and nationwide. This realization is not lost on its owner trio. "I was at a big show and was listening to a group of people talk about an incredible vintage and antique store," David Jeffers recalls. "Then I realized they were talking about us. It's just kind of surreal for us; we spend so much time making it happen, sometimes we don't pay attention." The original print version of this article was headlined "Best Vintage Decor Shop: BOULEVARD MERCANTILE"